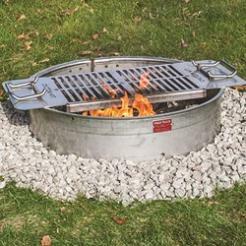 Model DIG-U2 is a Removable Cooking Grate for your firering or fire pit. 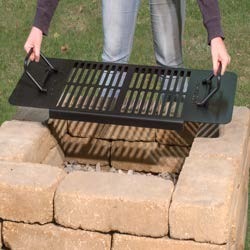 When you want to grill over your campfire just place Model DIG-U2 “drop in” grate across your steel firering or other brick or block fire pit. Lift it off when you are done cooking. 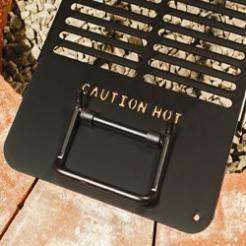 Model DIG-U2 drop in cooking grate is fabricated from a single piece of 10 ga. thick black/carbon steel plate, and laser cut to form the shape and grate bars. Die-formed edge flanges and welded on grate support strips add more strength. It is finished with high temp non-toxic black enamel paint. This unit ships fully assembled. Model DIG/S-U2 drop in cooking grate is fabricated from a single piece of 11 ga. thick stainless steel plate, and laser cut to form the shape and grate bars. 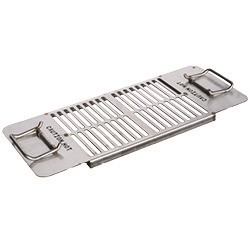 Die-formed edge flanges and welded on grate support strips add more strength. The handles are also stainless steel. This grate is not painted. This unit ships fully assembled. The 1/2-inch diameter handle bars are permanently attached, and lay flat when not in use. Cooking area dimensions are: 21-1/2” x 15-1/4”; 328 sq. inches total. Overall dimensions: 36-1/2” long x 15-1/4” wide. Model DIG-U2 weighs 23 lbs. Model DIG/S-U2 weighs 20 lbs. Round Firerings and Fire Pits: 27” - 31” inside diameter. 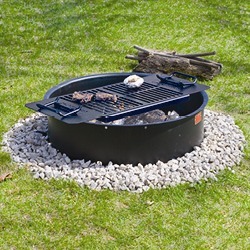 Square Fire Pits: 23” – 27” inside dimension. 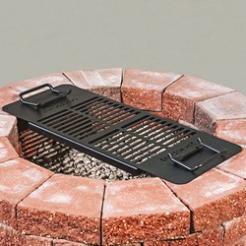 Model DIG-U2 and DIG/S-U2 drop in grate will work with steel rings or stone/concrete fire pits. Use this grate with your backyard firepit and pack it with you when you go picnicking or camping. Lead TIme: 1-2 weeks. This item is "Built to Order"